The content of this article provides interesting history, facts and information about the Colosseum & Christian Martyrs. Many early Christians were persecuted due to the edicts of various Roman Emperors. Many of the early Christians were tortured and sentenced to terrible deaths, some of which took place in the Colosseum. The Colosseum eventually became synonymous with the Christian Martyrs who died in its bloody arena. A Christian Martyrs is defined as a man or a woman who is murdered or put to death for his Christian faith or convictions. Many Christian martyrs suffered cruel and torturous deaths like stoning, crucifixion, and burning at the stake at the Roman Colosseum. The word 'martyr' comes from the Greek word translated "witness." Martyrdom is the result of religious persecution. The first known Christian martyr was Saint Stephen as recorded in the Acts 6:8–8:3, who was stoned to death at Jerusalem in A.D. 35. Many more Christian Martyrs followed his fate and the Roman Colosseum became a place of numerous Christian executions. There were many different types of executions in the Colosseum. Christian Martyrs were executed as common criminals by crucifixion or "damnatio ad bestia" (thrown to the wild beasts). The vicious and cruel emperors and Romans delighted in even more novel ways of executing Christian Martyrs. The Emperor Nero introduced twilight executions where hapless Christians were nailed to the cross and burned alive as torches to light the arena of the Colosseum. The Catholic church of the Medieval and Renaissance periods believed that the Colosseum should be revered as Holy due to the Christian Martyrs who died within its walls. Various crosses in the middle of the arena and the twelve stages of the Crucifixion were regularly used for religious displays and processions remained until February, 1874, when they were removed by order of Commendatore Rosa. In the Roman Colosseum there is now a cross to remember the Christians that died in the arena. The Roman Emperors sat where the cross is now placed. The first of the Christian Martyrs at the Colosseum was believed to be Saint Ignatius. Ignatius was the Bishop of Antioch. In 107 AD the Emperor Trajan came to Antioch and forced the Christians to choose between the Pagan Roman gods and death. Ignatius refused and the emperor condemned him to death by being torn to pieces by wild beasts at Rome "damnatio ad bestia". Ignatius travelled to Rome, guarded by soldiers, and showed no fear of being devoured by lions in the Roman Colosseum. The wild beasts left nothing of his body, except a few bones. The bones were secretly retrieved from the Colosseum and returned Antioch, until their removal to the Church of St. Clement at Rome, in 637. Telemachus was the Christian Martyr who played a major part in the end of the gladiatorial games and the Decline of the Roman Colosseum. Telemachus was a Christian monk from Egypt who was visiting Rome. He went to the Colosseum and was so shocked at the bloody carnage that he stepped into the arena shouting that the slaughter should be stopped. The outraged 'mob' stoned him to death. Some time following the death of Telemachus the Emperor Honorius issued an edict that gladiatorial combats were to stop. 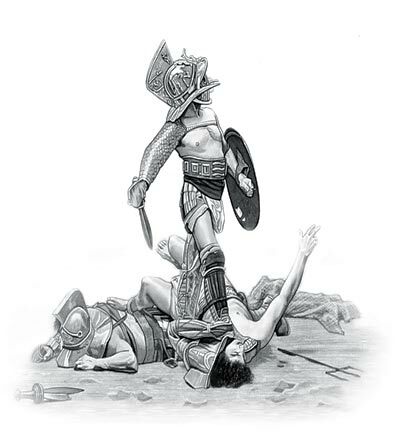 The content of this Colosseum & Christian Martyrs category on life in Ancient Rome provides free educational details, facts and information for reference and research for schools, colleges and homework. Refer to the Colosseum Sitemap for a comprehensive search on interesting different categories containing the history, facts and information about Ancient Rome. Just like the subject of Colosseum & Christian Martyrs there is hardly a page of Roman history and the Romans that is not, on some way, connected to the Roman Colosseum which became a symbol of Rome, its society, culture and life.